Reduce your company's data costs up to 60% and permanently eliminate bill shock. 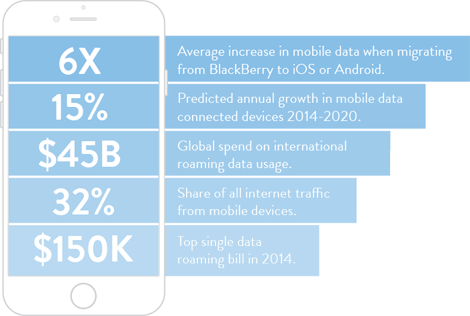 Mobile data optimization that puts you in control. Mobile Data Optimization, pioneered by Wandera through its proprietary cloud data compression and policy engine, helps businesses manage their mobile data charges, providing real-time visibility and policy control, delivering large savings and avoiding bill shock. Wandera is the world's first and leading global provider of Mobile Data Optimization (MDO), providing businesses with savings, control and visibility of their mobile data usage. Powered by its proprietary cloud-based data compression and policy engine, Wandera works transparently for mobile devices wherever they are in the world, without changing the user experience. Wandera lets you get the most from your data plans and proactively manage your cost exposure and content access based on actual usage metrics. You can enter your own roaming cost per country for example. Everything is configurable by you and customized to your actual usage and exposure. Cut data by up to 60%. Average savings of $200/month/user on roaming. Get the most from your data plans and proactively manage your cost exposure and content access based on actual usage metrics. Optimizes all content across video, images and text thereby significantly reducing data usage without impacting users. Determines the content type and destination, user, group and location, and automatically applies your usage policy. Flexible data capping so you can throttle data but still enable access to critical corporate resources such as email and the company intranet. Talk to an iRoam mobile data optimization expert. From concept to application, we know the ins and outs of getting the most from your data plans and proactively managing your cost exposure.